I was excited to get this tape in the mail. And that's not a sentence you'll see me type all that often. 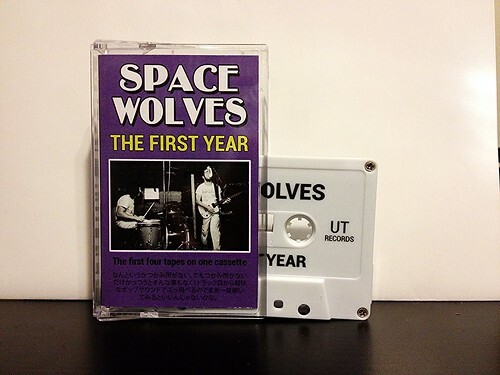 But, I was already familiar with Space Wolves having received and really enjoyed their last cassette IV. This particular cassette compiles the first four Space Wolves tapes into one release. The band is great. They play a jangle-y, treble heavy guitar style of pop. They seem to draw a great deal of influence from the late 50's and early 60's as their songs have a refreshing simplicity and charm that you just don't hear that often anymore. However, the band manages to take these influences and filter them through a modern garage-pop sensibility that makes Space Wolves stand out from the crowd. The one thing I will say is while the convenience of having all of these songs in one place is handy and economical (this tape is only 4 bucks from the labels webstore), there's just too much to listen to in one sitting. There are FIFTY songs on this cassette. Even though many are quite brief, this is just far too much to digest in one go through. That's not a shot at Space Wolves specifically as I would be stumped to think of any band that I want to listen to that much of all at once. If you tackle this in segments, it's a great couple of listens. Dan Sartain - Pass This On 7"